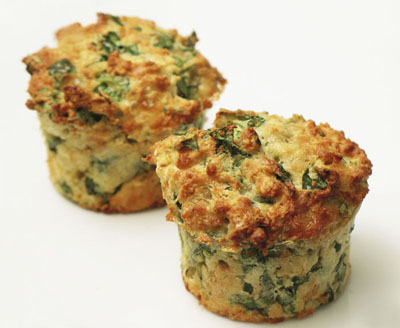 If you love kale, try these tasty muffins. Serve with fresh salad leaves drizzled with balsamic glaze or vinegar, with a dollop of mango chutney on the side. 1Heat the oven to 180°C (160°C in a fan oven), 375°F, gas 5. Grease muffin tin with SUNBURST then dust with flour. 2Squeeze the water out of the kale and chop finely. 3Add the kale and crushed garlic to a pan and fry until garlic is cooked and absorbed. Then turn off heat and add ½ the salt, the nutmeg and ground black pepper and mix together. 4Whisk together the eggs, melted SUNBURST and milk and stir into the kale mix. 5Sift flour, baking powder and salt together in electric mixing bowl. 6Add flour mixture to the kale mix. Fold in well, then fold in the cheeses, ensuring that all the ingredients are moistened slightly.